This species is accepted, and its native range is Venezuela (Aragua), Peru, Sierra Leone, Cameroon, S. Tropical & S. Africa, Madagascar, Réunion. On trees in forest; 2, 500 to 6, 500 ft. alt. Epiphytic, less often on wet rocks, rarely terrestrial. Rhizome erect or creeping, 3–7 mm diameter, and with mid-brown clathrate lanceolate entire sharply acute rhizome scales 1–3 × 0.2 mm. Fronds tufted or slightly spaced, arching or hanging, firmly herbaceous, 15–65 cm long, not proliferous. Stipe matt brown or green above and black beneath, often darker towards the base, 6–20 cm long, with scattered scales similar to those on the rhizome, otherwise glabrous at maturity. Lamina narrowly to very narrowly oblong, 13–45 × 4–9(–16) cm, 2-pinnatisect to weakly 3-pinnatifid, lowest pinnae not reduced, apical pinnae decrescent, apical pinna linear and muchlobed. Pinnae in 15–21 pairs, subopposite to alternate, unequally rhombic-attenuate, 2–7(–12) × 0.5–2.5(–3) cm, petiolate, very unequally cuneate at the base, the basal acroscopic lobe often oblong and larger than the rest, deeply pinnatifid into 4–9 pairs of narrowly ob-cuneiform to linear truncate-denticulate or truncate-serrate lobes, the lobes of the pinnae ± equal except for the basal acroscopic lobe; glabrous on both surfaces. Rachis matt brown, glabrous at maturity. Sori 1–3 per lobe but also characteristically on the wing along the costa, linear, 1–7 mm long. Indusium linear, membranous, entire, 0.3–0.5 mm wide. Fig. 9: 1–2, p. 54. Gilbert 3467 from T 2, Kilimanjaro, Ngare Nairobi north river, 2550 m, Aug. 1969, differs in the many glandular hairs on rachis and upper lamina surface. 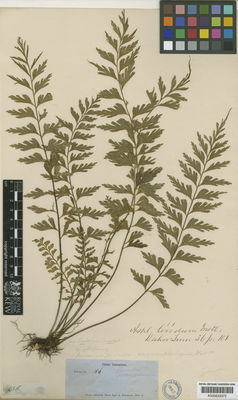 The fronds resemble narrow, weakly 2-pinnatifid fronds of A. aethiopicum in size and shape of the lamina, but the taxon differs in smaller rhizome scales; the fronds are also narrower, and the sori are arranged in a different way..
Tard. in Mém. I.F.A.N. 28 : 195, t. 38, fig. 5 (1953). U.K.W.F. ed. 2: 30 (1994).